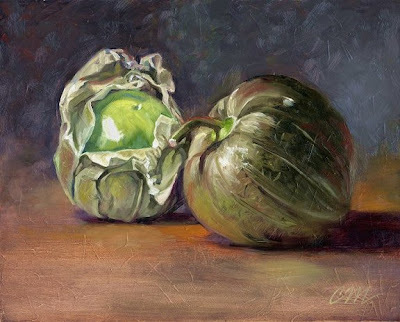 "Two Tomatillos" 10" x 8" oil on hardwood panel--a piece from awhile back I initially wasn't sure about ; but it has grown on me a little. If our lives must be devoid of the everyday struggles that occur when we commit to family, friends and all things that actually are the center of just about anything we want to represent as artists just so we can "create",what do we represent when we create? I hope you all start to feel better soon. My wife had to miss work today...and she does not miss work!...but she's starting to feel better. Oh, yeah...I started a new blog. You can go to patgibbs.blogspot.com...Click on pat gibbs' writing magic post. It's a spot I'm putting stuff that I'm doing as writing lessons from Gail Carson Levine's "Writing Magic"...It's fun. I am one of those guys who has supported my Fam with one income. Its hard, but it can be done. I read recently that my mentor Sam Hyde Harris, was of the same mind set as Payne. His children have no memory of any meaningful participation with them. How sad and narcissistic. It does change how I view him as a man. Frank, As you know I can certainly relate. My son has been having a really tough time , especially since June when along with his autism he started having grand mal seizures. We are home schooling and watching constantly. For me, I treasure the painting even more.I don't take one minute in the studio for granted. Frankly, I think it saves me. I am transported with brush in hand to a land of color and texture at the times I can actually do it. I also sketch everywhere. He obviously is my priority, and when need be everything else gets dropped. Scheduling can be a bit of a task, but I just try and work things out. Would I like to have more time to work and think...of course. The river that is our lives just doesn't always flow that way. I saw your comment on Frank's blog that you had pneumonia. I want to wish you well and hope you improve quickly.